And [Solomon] spoke of trees, from the cedar that is in Lebanon even unto the hyssop that springeth out of the wall; he spoke also of beasts, and of fowl, and of creeping things, and of fishes. We are currently collecting all known historical lists of Metchosin species. If you can supply a list of any group of species at any Metchosin locale--including birds, plants, fungi, marine life, lichens, animals, insects, etc.--please contact Kem Luther (for phone number and address see contact information in "Contact Us" at the left). As we collect these lists, we'll be posting them on this page. The lists below, with one or two exceptions, focus on Metchosin and Vancouver Island. For BC lists see the E-Flora and E-Fauna (expecially the E-Fauna Species Checklists section) pages. Shyanne Smith of the Garry Oak Ecosystems Recovery Team (GOERT) has supplied us with a list of over 500 of the vascular plants (classified as grasses, forbs, trees, shrubs) found in the Garry Oak ecosystems of Southern Vancouver Island. Large portions of southern Metchosin were, and a few areas still are, Garry Oak meadows. A list of about 30 vascular plants from 2 releves prepared by Hans Roemer in 1996 to describe and classify “pocket grasslands” found on Metchosin land (Grass balds W of Veitch Creek, approximate UTM 10U 456110, 5363240). List transcribed 2011, names updated to present synonyms. List of about 120 vascular plant species from Ecological Reserve Proposal #320 north of Camas Hill. This property did not become an established reserve. List provided by Hans Roemer. A list of Metchosin vascular plants specimens archived at the Royal British Columbia Museum. Data extracted from the Consortium of Pacific Northwest Herbaria in January, 2011. A list of Rocky Point DND property vascular plants specimens collected by the Adolf and Oluna Ceska and archived at the Royal British Columbia Museum. Data extracted from the Consortium of Pacific Northwest Herbaria in February, 2011. The UBC Herbarium's online records for its collections cite Metchosin vascular plant species in several locations. Here are its lists for Metchosin, Albert Head, and Rocky Point (You may have to scroll to the second PDF page to view the list start.). The BC Species at Risk web site collects in one place the at-risk species from SARA, COSEWIC and BC legislation. Here are the vascular plants on the list that are found within the CRD. A list of plant species found at Devonian Park. From the CRD. A partial list of plants found at Witty's Lagoon. From the CRD, compiled by Joel Ussery. A list of wildflowers found at Witty's Lagoon. From the CRD. Garry Fletcher maintains a Race Rocks Species List and Image Gallery that has list of vascular plants seen at the rocks. Rare species list from DND Albert Head, May 2016. Survey of Significant Species at DND Albert Head by K. R. Summers, 2002. Species list from 2000/2001 VHNS Green Spaces report on Mary Hill battery lands. 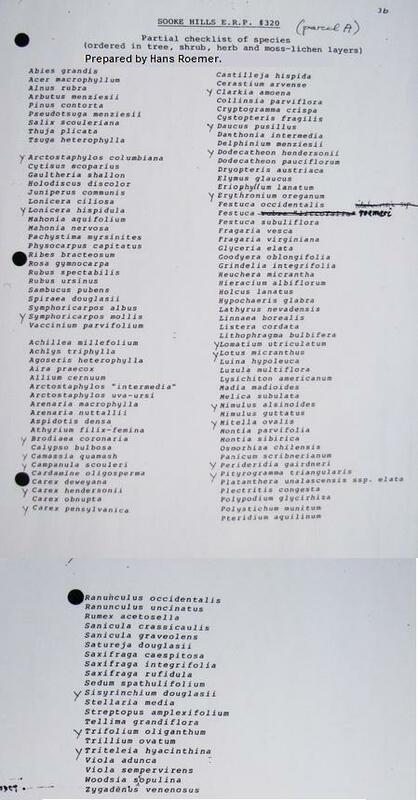 Species list by Martin Gebauer of Gebauer & Associates of the significant fauna and flora of the DND Mary Hill site, 2002, posted with permission. DND tracking list for Mary Hill rare species, March 2017. Posted with permission from Andrea Schiller. Shyanne Smith of the Garry Oak Ecosystems Recovery Team (GOERT) has supplied us with a list of over 70 of the mosses and liverworts typically found in the Garry Oak ecosystems of Southern Vancouver Island. A list of about 50 mosses found at Matheson Lake CRD Park in 2010 by Kem Luther and Gerry Ansell. 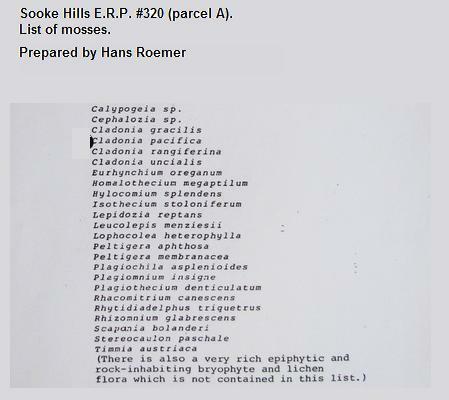 A list of 7 mosses from 2 releves prepared by Hans Roemer in 1996 to describe and classify “pocket grasslands” found on Metchosin land (Grass balds W of Veitch Creek, approximate UTM 10U 456110, 5363240). List transcribed 2011, names updated to present synonyms. List of about 20 mosses from Ecological Reserve Proposal #320 north of Camas Hill. This property did not become an established reserve. List provided by Hans Roemer. The UBC Herbarium's online records for its collections cite Metchosin moss species in several locations. Here are its lists for Metchosin, Peddar Bay, and Rocky Point (You may have to scroll to the second PDF page to view the list start.). The BC Species at Risk web site collects in one place the at-risk species from SARA, COSEWIC and BC legislation. Here are the three moss species on the list that are found within the CRD. Garry Fletcher maintains a Race Rocks Species List and Image Gallery mentions at least one moss. Bryophytes and Lichens of Open Bluff Habitats at Rocky Point, DND. List by Terry McIntosh, 2007. Kem Luther cumulative list of mosses and liverworts found at Matheson Lake Park. The UBC Herbarium's online records for its collections cite Metchosin fungi species in two locations. Here are its lists for Metchosin in general and for Rocky Point (You may have to scroll to the second PDF page to view the list start.). Ian Gibson, archivist for the Southern Vancouvers Island Mycological Society, has pulled together a summary of Metchosin macrofungi recorded by Oluna Ceska since 1999. List of fungi found at CFB Rocky Point in 2003. Oluna Ceska ESAC report. List of fungi found at Devonian Park during SVIMS (Southern Vancouver Island Mycological Society) spring trip, March 2015. List of fungi found at Pearson College during SVIMS (Southern Vancouver Island Mycological Society) spring trip, February 2016. Shyanne Smith of the Garry Oak Ecosystems Recovery Team (GOERT) has supplied us with a list of over 80 of the lichens typically found in the Garry Oak ecosystems of Southern Vancouver Island. The UBC Herbarium's online records for its collections cite Metchosin lichen species in two locations. Here are its lists for Metchosin (includes several Albert Head records) and Rocky Point (You may have to scroll to the second PDF page to view the list start.). The BC Species at Risk web site collects in one place the at-risk species from SARA, COSEWIC and BC legislation. Here is the lichen on the list that is found within the CRD. Garry Fletcher maintains a Race Rocks Species List and Image Gallery that has lists a number of lichens seen at Race Rocks. The Victoria Natural History Society maintains a checklist of Victoria-area birds. The BC Species at Risk web site collects in one place the at-risk species from SARA, COSEWIC and BC legislation. Here are the birds on the list that are found within the CRD. Marilyn Fuch's Towards a Recovery Strategy for Garry Oak and Associated Ecosystems in Canada contains a list of birds commonly associated with Garry Oak meadows. A checklist of birds seen at Rocky Point Bird Observatory on the Metchosin Rocky Point DND lands. A list of bird species found at Witty's Lagoon. From the CRD. A list of bird species found at Devonian Park. From the CRD. Garry Fletcher maintains a Race Rocks Species List and Image Gallery that has a list of birds seen there. This 2005 slide presentation by Travis MacKenzie lists, on p. 14, twenty of the common gastropods/mollusks that might be found on Metchosin beach areas. Other pages contain pictures of these animals. The BC Species at Risk web site collects in one place the at-risk species from SARA, COSEWIC and BC legislation. Here are the marine molluscs on the list that are found within the CRD (also includes land snails). Garry Fletcher maintains a Race Rocks Species List and Image Gallery that has a large list of marine organisms. A list of the mammals of Vancouver Island. Almost 50 mammals on the list. The BC Species at Risk web site collects in one place the at-risk species from SARA, COSEWIC and BC legislation. Here are the mammals on the list that are found within the CRD. Marilyn Fuch's Towards a Recovery Strategy for Garry Oak and Associated Ecosystems in Canada contains a list of mammals commonly associated with Garry Oak meadows. A list of mammals found at Devonian Park. From the CRD. Garry Fletcher maintains a Race Rocks Species List and Image Gallery that has several mammals on it. The BC Species at Risk web site collects in one place the at-risk species from SARA, COSEWIC and BC legislation. Here are the reptiles on the list that are found within the CRD. Marilyn Fuch's Towards a Recovery Strategy for Garry Oak and Associated Ecosystems in Canada contains a list of reptiles commonly associated with Garry Oak meadows. Marilyn Fuch's Towards a Recovery Strategy for Garry Oak and Associated Ecosystems in Canada contains a list of amphibians commonly associated with Garry Oak meadows. A checklist of dragonflies and damselflies of the Victoria region. List of insects (scientific names) from Camas Hill, done by a UVic student. A list of Camas Hill Butterflies and moths by Moralea Milne. The BC Species at Risk web site collects in one place the at-risk species from SARA, COSEWIC and BC legislation. Here are the insects on the list that are found within the CRD. A checklist of butterflies seen at Rocky Point Bird Observatory on the Metchosin Rocky Point DND lands. Survey of moths at Witty's Lagoon, 2001-2005, by Nick Page. A BC Museum list of insects and spiders catalogued from Metchosin before 2010 by Claudia Copley et. al. Garry Fletcher maintains a Race Rocks Species List and Image Gallery that has several insects on it. Yearly surveys of gastropods in CRD Parks are done for the Habitat Aquisition Trust. The survey reports the red-listed Threaded Vertigo snail at Devonian and other Metchosin locations. Regular searches are made in Devonian for the rare Blue-Grey Taildropper. The BC Species at Risk web site collects in one place the at-risk species from SARA, COSEWIC and BC legislation. Here are the slugs and snails on the list that are found within the CRD (List also includes marine molluscs.). Garry Fletcher maintains a Race Rocks Species List and Image Gallery that has a list of algae.